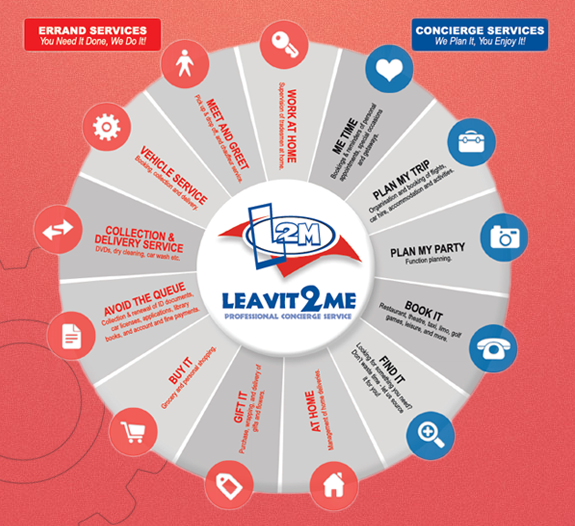 What value can a concierge add to your business? Our services are varied and this image just gives you an idea of what we do. The benefit of having a concierge at your business are endless. Less absenteeism: Employees won’t come in late or take extra time during their lunch breaks to accomplish the tasks that can be passed to a concierge. More job satisfaction: Employees will feel that their employer cares about them and wants them to be happy at work. Less stress: Tasks are taken care of, and research is done on behalf of the employee. Bookings are made and reminders sent. Suppliers are vetted and they can know that they are reliable. So aside from the services that we offer, these are some of the added benefits of bringing a concierge into you business. What are you waiting for? Contact us today!